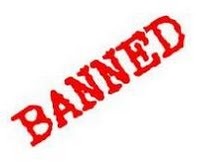 While webcam chatting on chatroulette you may get banned because of screenshots of both men and women and however someone may report you and it results with a block for you not to enter the Chatroulette. So you must again consult to Chatroulet in order to be unbanned. How To Unban On Chatroulette? You can ask it to Chatroulette but it takes a long time and it's not quaranted. So we offer you to change ip. You can use Proxy system or Ultrasurf or just reseting modem. But while doing these methods you also must clear all cookies on your pc. See Also omegle unban page for more help.